The Rev. Al Sharpton speaks to parishioners at the Greater St. Marks Family Church as the community seeks answers about the police shooting of Michael Brown on August 17, 2014 in Ferguson, Missouri. Prominent civil rights leader Al Sharpton announced he plans to rally for Markeis McGlockton next weekend. CLEARWATER, Fla. -- The Rev. Al Sharpton plans to rally for Markeis McGlockton, the 28-year-old man shot and killed during an argument over a parking spot. 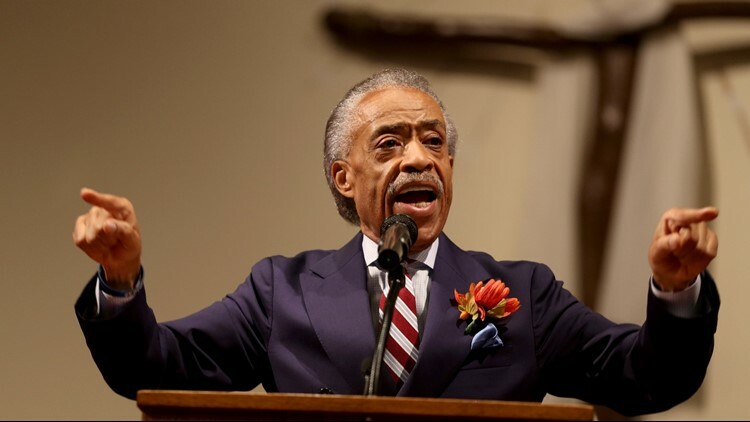 Sharpton announced the 4 p.m. Sunday, Aug. 5, protest with the National Action Network at St. John Primitive Baptist Church during his MSNBC TV show and on Twitter. The church is located at 1002 Palmetto St.
McGlockton was killed on July 19 by Michael Drejka just outside the Circle A convenience store. McGlockton's girlfriend parked in a parking spot for a disabled person, which appeared to make the 47-year-old Drejka angry. All of it was captured on store surveillance video: McGlockton left the store and confronted Drejka, pushing him to the ground. Seconds later, Drejka shot him. The case has made national headlines in recent days as law enforcement didn't immediately arrest Drejka, who told deputies he was fearful for his life. "The law in the state of Florida today is that people have the right to stand their ground, and have a right to defend themselves when they believe they are in harm," Pinellas County Sheriff Bob Gualtieri said during an earlier press conference. The state attorney’s office now is considering if Florida's "stand your ground” law actually should apply as a possible defense or if Drejka should be charged.